At Blue Buoy Swim School, we believe that students learn best when provided with fun, interactive instruction that focuses on the needs of the individual instead of trying to fit everyone into the same cookie-cutter environment. That’s why, in addition to our low-ratio group classes, we provide semi-private and private classes that expand your options and allow you to tailor lessons to your child’s specific needs. Like all of our lessons, these classes feature our internationally renowned instruction methods and positive reinforcement teaching philosophy. In each of our semi-private swim classes, a single instructor works with two students who are close in age and have roughly equal swimming skills. You and your child might choose this lesson format for several reasons. First, some students either want or need a bit of extra teaching attention while learning how to swim. The small class size ensures that this level of personalized attention is given. A semi-private class can also provide important benefits by giving the two participating students a chance to interact closely, share the gains of improved swimming performance and partake in a bit of friendly rivalry. In addition, the shared experience of a semi-private class often leads to lasting childhood friendships, as well as close relationships between the children’s families. Our private swim classes provide an even more focused environment that pairs one instructor and one student. In this setting, your child will receive all the attention needed to maximize the learning experience and gain all the personalized benefits of swim lessons. This format works equally well for beginning students and experienced swimmers who need one-on-one training to master certain strokes or prepare for competition-level performance. Beginning students benefit from private classes because they have the opportunity to get customized instructor feedback over the entire course of each lesson. This may be especially important for children who don’t feel they’re natural swimmers, or who otherwise feel concerned about taking that first leap into the water. The same principle applies to children with special needs, who can ultimately develop strong swimming skills, but may require individualized instruction to reach their true potential. Private classes give experienced swimmers the same access to constant customized feedback at each step of the instruction process. This focused attention can increase your child’s comfort while learning the fine points of technique that fall outside the range of beginning instruction. It can also significantly decrease the amount of time it takes to develop advanced swimming skills. If your child needs to work on specific skills to prepare to work as a lifeguard or gain a Scout badge qualification, participation in a private class can provide just the right kind of focused instructional environment. Private swim lessons can also provide your child with just the edge needed for successful performance in school competitions, seasonal leagues or important tryouts. Conveniently headquartered in the City of Tustin, Blue Buoy has proudly served the residents of Orange County for 60 years. 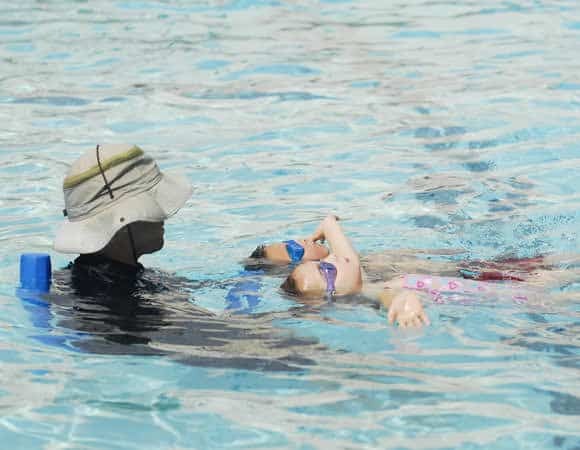 All of our swim teachers have full First Aid and CPR certification, and undergo comprehensive practical and theoretical training in our internationally celebrated instruction techniques. With our top-flight facilities, deep commitment to excellence and devotion to our customers and the larger OC community, we stand as one of America’s most successful, enduring options for quality swim instruction. Contact us today and learn why generations of area residents have come to regard us as members of their extended family.